nity Benjamin Constant, in northeastern Para. 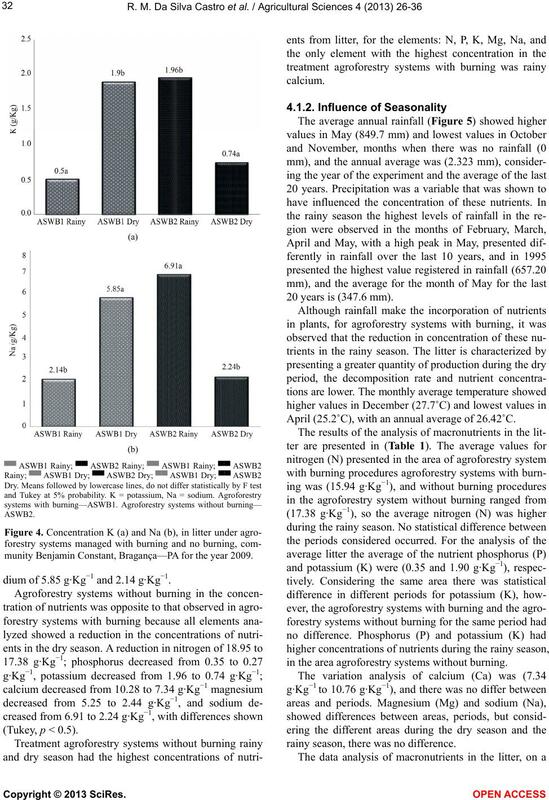 concentrations of nutrients in the dry season. presented Fe > Mn > Zn > Cu. through a higher contribution of litter. vegetation and the soil . inter relationships with the environment. vegetation to the soil . 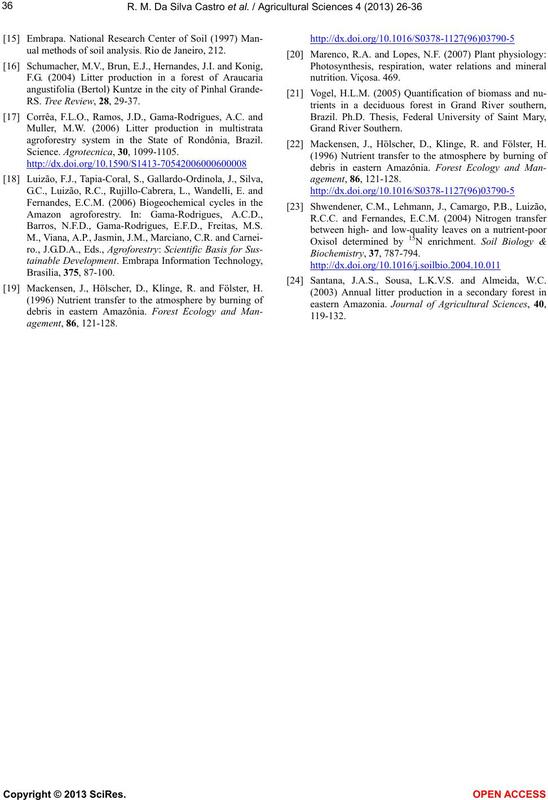 soil function in these systems. 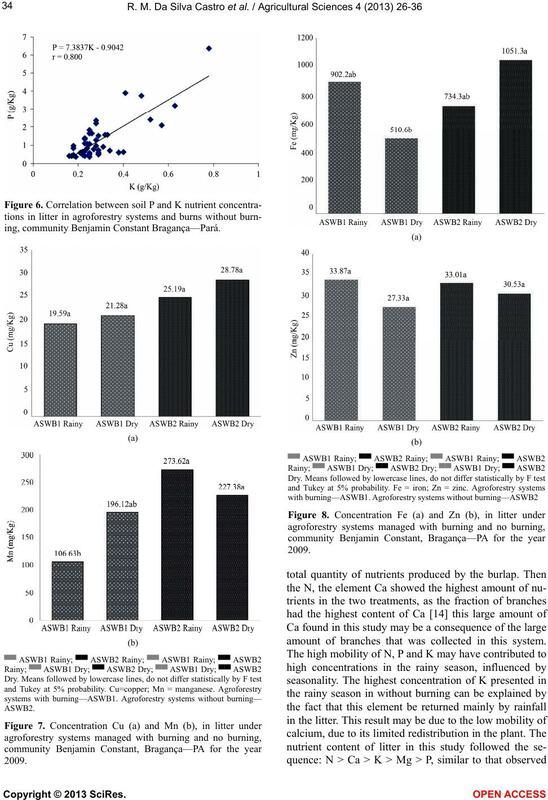 variation influences on primary forest litter. behavior of a native forest in terms of litter dynamic. twice bigger than the component crops. 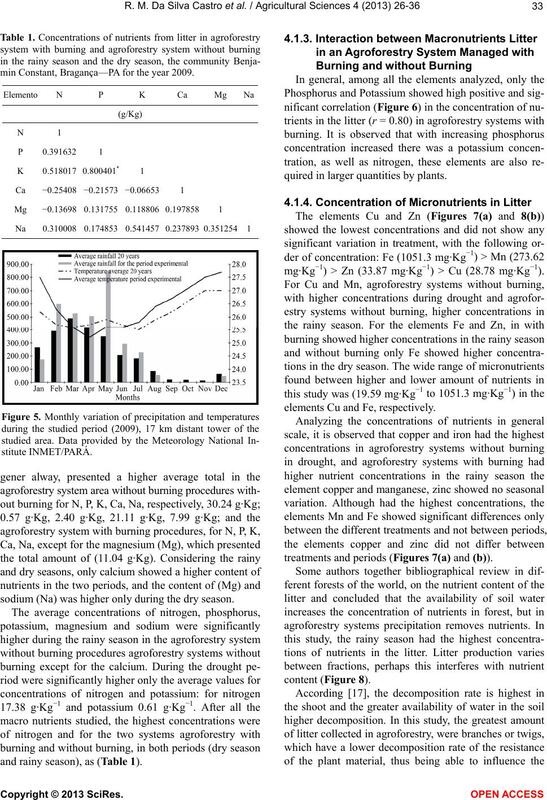 hot esculento) and corn (Zea mays) (Figure 1). average annual evaporation of 50.1 mm . the rainy station and August to December the dry station. data are collected on precipitation and temperature. These data meteorological were provided to this work. ate water deficit during the August-December period. (Source: UAS, Emílio Goeldi Pará Museum, September 2010). Figure 1. Location map of Benjamin Constant, city of Bragança—PA. 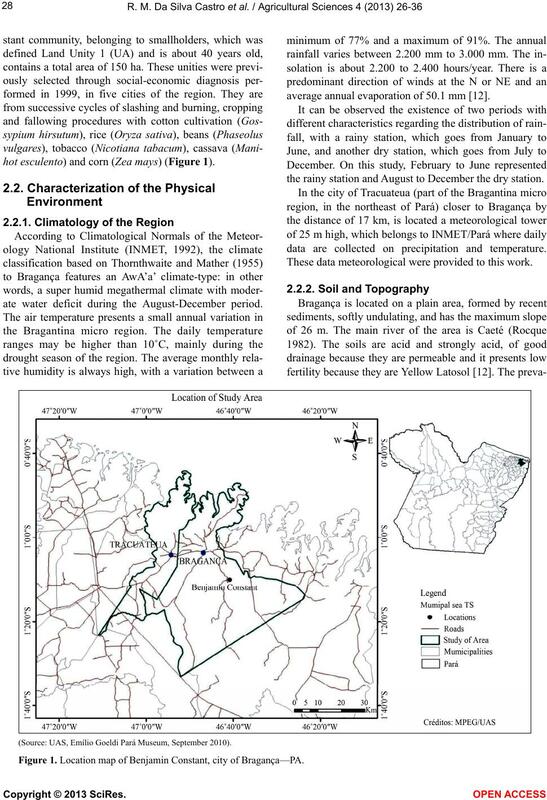 hydromorphic and alluvial soils near the coast. vegetation in the region is secondary tropical rain forest. m × 8 m space. the blue coloration it can be taken out of the distiller. done for reading, until the color pink is achieved. to 0, 1, 2, 3, 4 and 5 ppm. copper and zinc, 0, 0.1, 0.2, 0.3, 0.4, and 0.5 ppm. son and dry without burning in the rainy and dry seasons. with burning, 18.95 g·Kg−1 and 0.35 g·Kg−1, respectively. this element did not vary as a function seasonal climate. ▀▀ ASWB1 Rainy; ▀▀ ASWB2 Rainy; ▀▀ ASWB1 Rainy; ▀▀ ASWB2 Rainy; ▀▀ ASWB1 Dry; ▀▀ ASWB2 Dry; ▀▀ ASWB1 Dry; ▀▀ ASWB2 Dry. with burning—ASWB1. 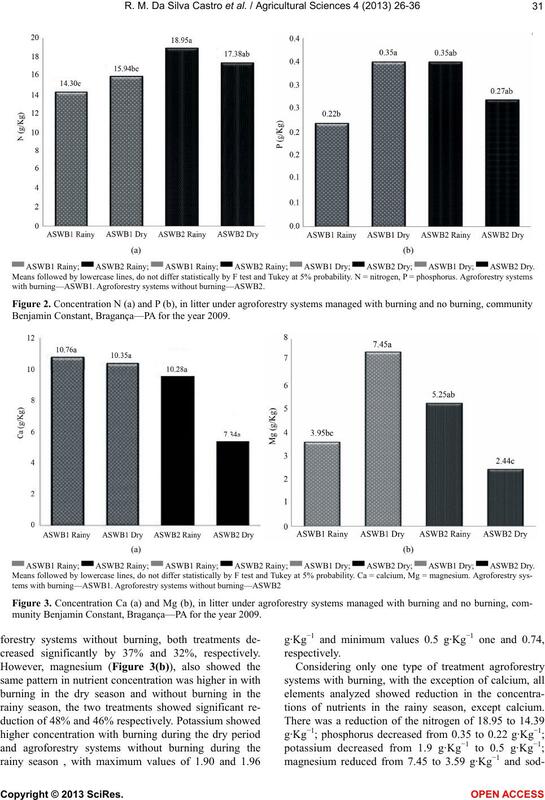 Agroforestry systems without burning—ASWB2. Benjamin Constant, Bragança—PA for the year 2009.
munity Benjamin Constant, Bragança—PA for the year 2009.
creased significantly by 37% and 32%, respectively. tions of nutrients in the rainy season, except calcium. dium of 5.85 g·Kg−1 and 2.14 g·Kg−1. 20 years is (347.6 mm). April (25.2˚C), with an annual average of 26.42˚C. in the area agroforestry systems without burning. rainy season, there was no difference. min Constant, Bragança—PA for the year 2009.
sodium (Na) was higher only during the dry season. and rainy season), as (Table 1). quired in larger quantities by plants. mg· K g −1) > Zn (33.87 mg·Kg−1) > Cu (28.78 mg·Kg−1). elements Cu and Fe, respectively. treatments and periods (Figures 7(a) and (b)). ing, community Benjamin Constant Bragança—Pará. amount of branches that was collected in this system. sheets that have been collected . vast majority of tropical soils. 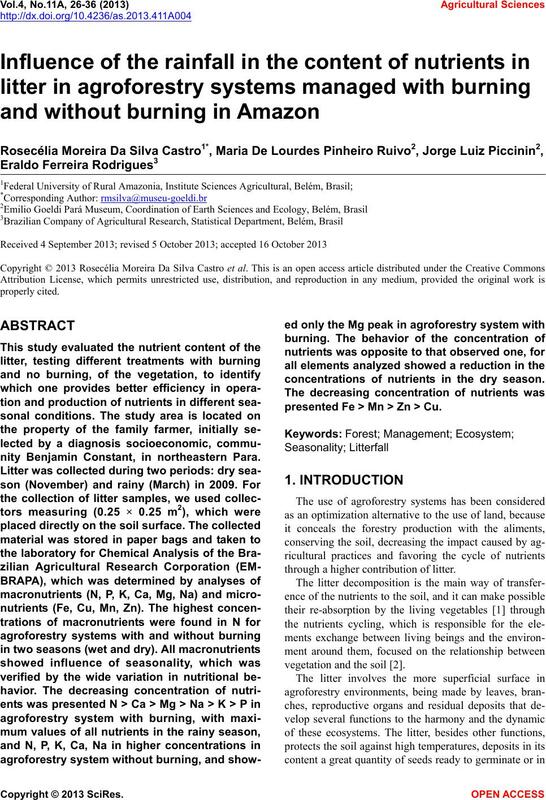 centration of micronutrients has no seasonal influences. of rainforest. Core Review, 2, 42-059. G.C., Luizão, R.C., T Rujillo-Cabrera, L., Wandelli, E.
systems and Environment, 99, 15-27.
deployed for recovery of degraded areas in Viçosa, MG.
free fallow management in the Eastern Amazon, in Brazil. 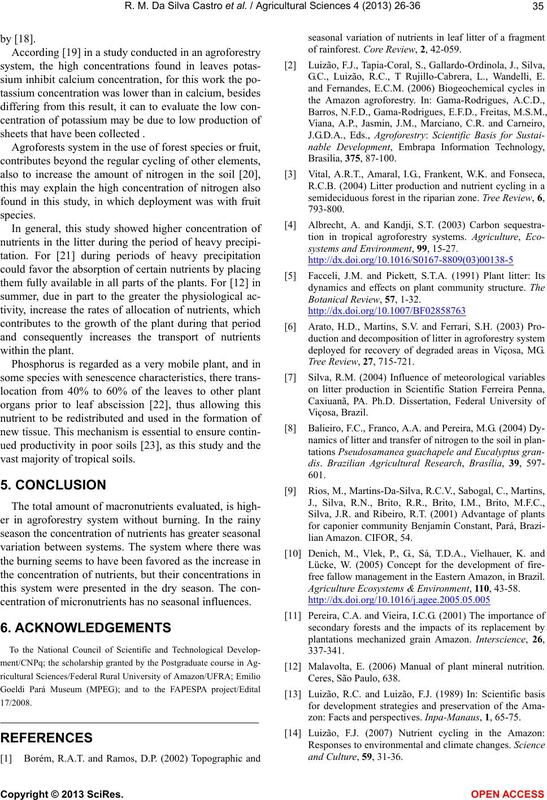 Agriculture Ecosystems & Environment, 110 , 43-58. 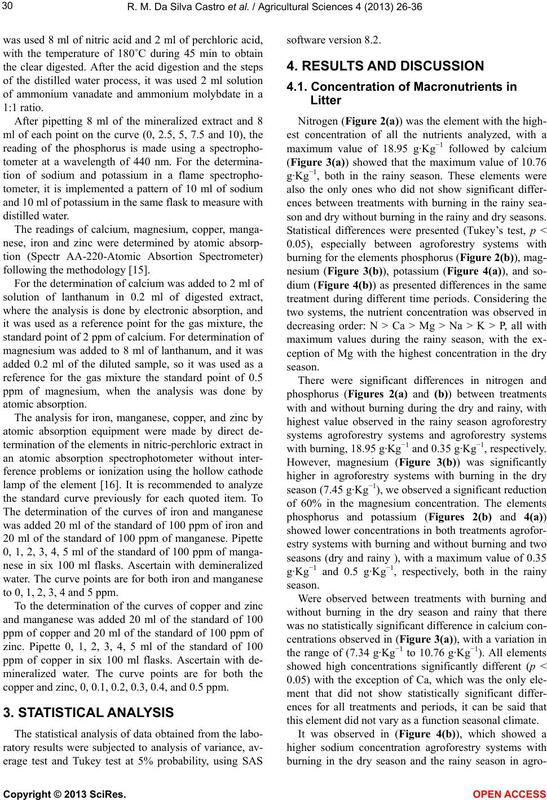 Malavolta, E. (2006) Manual of plant mineral nutrition. zon: Facts and perspectives. 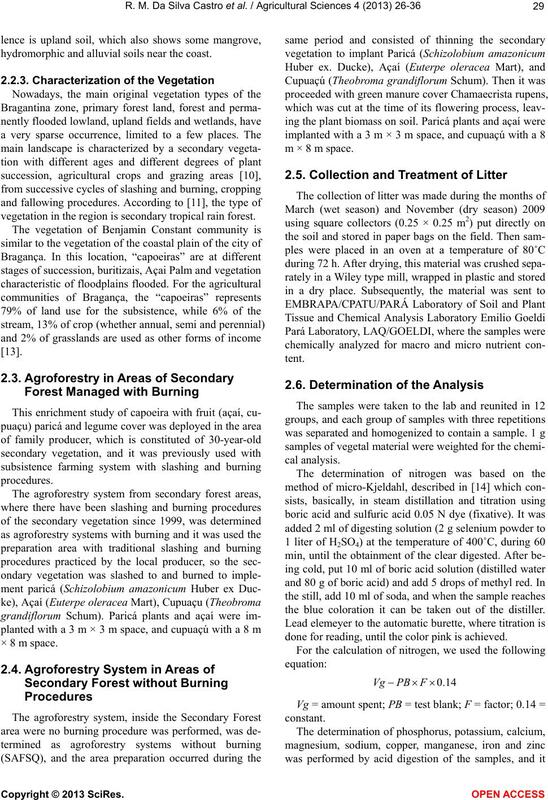 Inpa-Manaus, 1, 65-75.
ual methods of soil analysis. Rio de Janeiro, 212. RS. 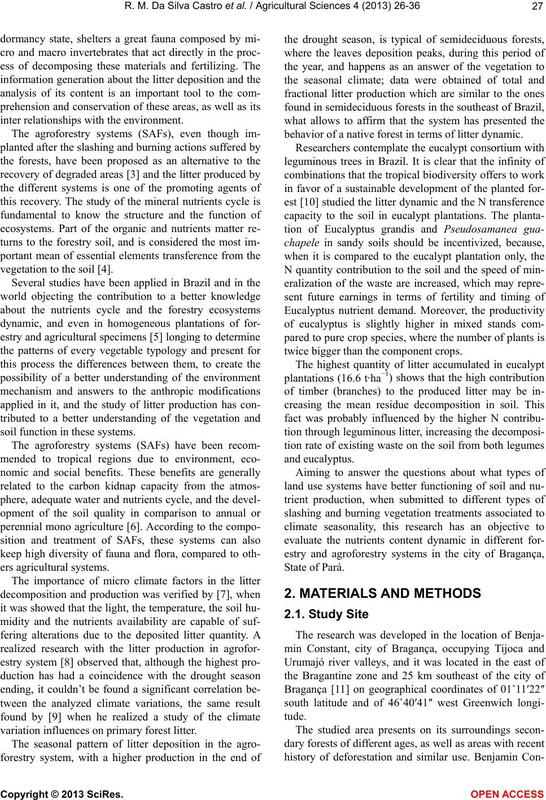 Tree Review, 28, 29-37.
agroforestry system in the State of Rondônia, Brazil. Barros, N.F.D., Gama-Rodrigues, E.F.D., Freitas, M.S. Mackensen, J., Hölscher, D., Klinge, R. and Fölster, H.
 Santana, J.A.S., Sousa, L.K.V.S. and Almeida, W.C.